Wellness care: "An ounce of prevention is worth a pound of cure" That saying holds true for horses also. As part of our routine care we can provide individual tailored specific vaccinations, individual deworming plans, digital Coggins testing, and dental care. At the time of service we can discuss any issues you may have with your horse including nutritional needs, training programs, geriatric care, etc..
Time of need care: We offer care for your horse in cases of medical colic, sickness, lameness, injury, metabolic problems, or chronic illness. We are equipped to provide intravenous fluids and most laboratory results are obtained within 24 hours. Emergency care is provided on a 24 hour basis. For more serious illnesses and injuries we work with several local referral centers. Pre-purchase examinations: An extensive physical examination, lameness evaluation, neurologic examination, and drug screen is offered by us prior to purchasing your horse. 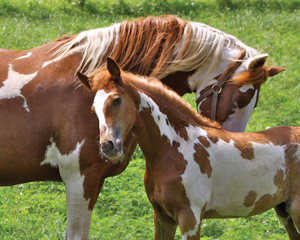 The information gathered is used by the prospective buyer and/or agent to determine whether the horse will be servicable for it's intended use. The exam often includes laboratory testing, radiographs, endoscopy, and ultrasound exams. Geriatric care: Aged horses can have sub-clinical health care issues that can be identified and treated before they become a problem. If your horse is over 15 years of age we recommend a complete physical examination and blood testing to establish baseline values. Lameness examination: Evaluate the locomotion of your horse. We use a variety of techniques to identify the source(s) of lameness including physical examination and palpation, flexion tests, and joint and nerve blocks. Radiography, ultrasound, and laboratory tests help us to further evaluate the source of your horse's lameness. Surgery: Standing or recumbent surgery of the horse is performed for castration, biopsy and laceration repair. More complicated procedures may be referred to a specialist. Ultrasonography: We offer ultrasonography and it uses sound waves to evaluate soft tissues like tendons and ligaments, reproductive organs, lumps, and tumors. It is painless and non-invasive. Radiography: Our portable x-ray machine uses x-rays to visualize bone for abnormalities including arthritic changes, fractures, ocd, bone cysts and bone infection. Endoscopy: Utilizes a fiber optic device for evaluating the upper airway of the horse, including the larynx, sinuses and guttural pouches. The trachea and upper esophagus can also be examined with this flexible device. Useful in prepurchase examinations, pneumonias, or reactive airway disease. This is offered on a referral basis. Acupuncture: is an ancient Chinese practice that utilizes needles to stimulate nerve pathways to heal many problems. Often, chinese herbs will be prescribed to aid in therapy. This is offered on a referral basis. Chiropractic: Is offered on a referral basis. Tonometry: is a procedure that measures the intraocular pressure of the eyeball and is useful in detecting glaucoma and uveitis (moon blindness) in horses.